Learn the systematic methods used by investigators as they conduct thorough searches and create illustrations. 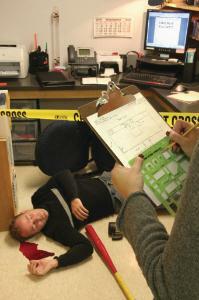 By performing a variety of crime scene search methods, several types of crime scene sketches can also be practiced. Strip, spiral, wheel, grid, and zone searches are addressed in addition to rough, final, cross projection, baseline, smooth, and street sketches. Includes materials for six setups.